Stay at a RESORT with 11,000 sq ft Lagoon Pool waterfall lagoon pool, heated winter pools, kids splash zone, rope climb, golf course, Plexicushion tennis courts, gym, RESTAURANT, POOL SIDE BAR, and take out pizza. Spacious 2nd floor, 3 bedroom, 3 bath condo sleeps 12. Overlooking the emerald water, just steps to the sugar sand beach, pools, dining, bar and parking. Full kitchen, 2 walk in showers. 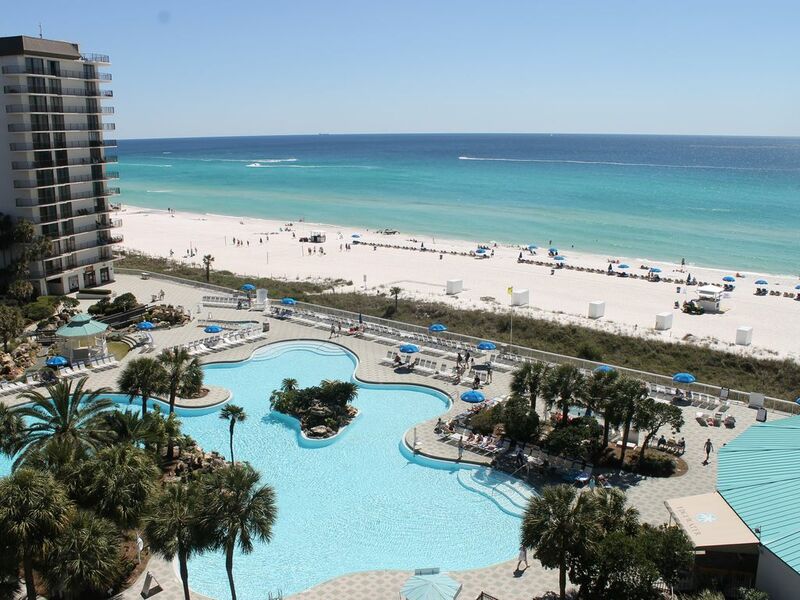 Close to Pier Park, shopping, boating, fishing, attractions, water park and restaurants. A great location and wonderful 3 BR property. The views from the unit is amazing! We had a great vacation! Our 2nd floor room was steps away from the large pool, which was awesome. The restaurant and bar beside the pool were great also. Mere steps to the beach. The beach was the clearest and prettiest I think I have ever seen it and we come to PCB almost every year. Trina was great to work with and answered any concerns we had immediately. The toilet in the master bath wouldn’t stop running, so I text her and we left to go to the beach and by the time we got back it was fixed. The condo itself was spacious, plenty of room for 6 adults and 6 kids. We never felt crowded, and everyone slept comfortably. We will be back! We greatly appreciate your business!! Look forward to your return. The 2nd floor was perfect because we did not have to use the elevator. The stairs were not bad at all. Having the 3 bedrooms and 3 baths were perfect. Beds were comfortable enough. We will definitely stay again. we enjoyed having your family stay with us and look forward to you returning!! Your business is greatly appreciated!!! Will defintely go back. Great view of ocean. Short walk to pool and ocean. Did not have to use elevator once whole there. Trina was great to work with and replied and addressed any problem we had. Great vacation ! Loved having you as our guest!! Look forward to working with you again in the near future!!! Beautiful condo! Awesome view! Huge pool! Great place, great staff! Highly recommended! Thank you for the review and I am so glad that you had a great experience!! Hopefully you can come back soon. So glad you have a wonderful stay. Hope to have you back soon! !